The Apple Watch is the best-selling smartwatch in the world, but it’s hardly the only game in town. If you’re not into Apple’s wearable or if you have Android, you should definitely take a look at the newest offering from Fitbit. It’s called the Fitbit Versa Smartwatch, and it’s easily the most impressive smartwatch Fitbit has created so far. 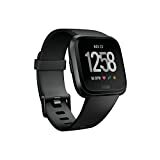 It handles all the step tracking and workout tracking you want, and of course it also monitors your heart rate.You can also get all your alerts on your Versa watch and the battery lasts for 4 days on a single charge!